Lovely Art Noveau era frame. 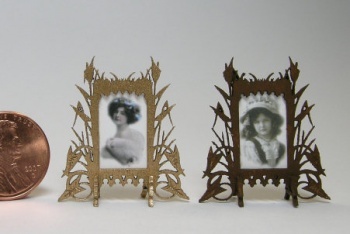 Elaborate design is delicately laser cut from wood. Easel back frame measures 1 3/16" h x 1 1/8" w.
Included in the kit are all laser cut wooden pieces,several tiny antique photos sized perfectly to fit this frame, and complete instructions. You can paint or stain this piece as shown here. Note: kit contains materials for ONE frame. Two are shown in the photo as examples of finishing methods. You will need Xacto knife, scissors, and glue to assemble, and the finish of your choice.